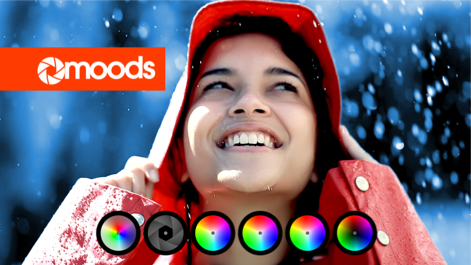 Moods is an intuitive color correction plug-in that provides a set of tools to perform simple color balance and stylized looks. A heads up display showing 6 wheels and several buttons located at the bottom of the canvas. In the Effects window, you will find the numerical values corresponding to the on-screen controls, global settings and a set of auxiliary parameters. A Help Card can be displayed above the wheels that show their function. To quickly experiment different "moods," the plug-in provides an assortment of looks through templates in Final Cut Pro X and a presets pop-up menu in Motion And After Effects. Wach a Tutorial by Noise Industries.